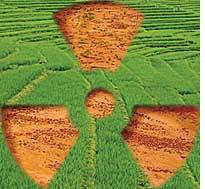 mango orchards in Gujarats Bhavnagar district and paddy fields in Andhra Pradeshs Srikakulam district will disappear under nuclear power parks that will have eight power plants each. The government approved the projects in the last week of September. The US India Business Council (usibc), a trade group from Washington that lobbied hard for the sites, is upbeat. Andhra Pradesh and Gujarat are excellent locations. These places have abundant human talent to erect and maintain these state-of-the-art facilities, said Ron Somers, president of usibc. The council is pushing the civil nuclear liability bill that is crucial to the construction of these plants (see Radioactive mirage, October 15, 2009). Villagers have started protesting.The nuclear park in Gujarat will affect at least 30,000 people in five villages in Mithivirdi area known for its mango and cashew plantations. People stand to lose more than 400 hectares (ha) and have submitted a memorandum to the district administration to scrap the project. Krishna Kant of the citizens forum, Gujarat Sarvodaya Mandal, said when the villagers met the district collector to lodge their complaint on October 15 he tried to win them over with promises of good compensation. Shakti Singh, a 40-year-old farmer of Jasapura village, said people do not want nuclear plants close by. Health concerns apart, most farmers will be rendered jobless if their land is taken away. Only a few educated farmers know how to benefit from the compensation, said Singh. Kant pointed out that studies show high incidence of birth deformities and cancer among people living near nuclear plants. We will oppose the project till the end, he said. Nuclear Study Group, a non-profit in Bhavnagar, is preparing a report on how the nuclear park will impact people. In Andhra Pradesh, the nuclear park will be built on 2,400 ha in Kovada village where people grow rice and culture fish. The project will affect 20 villages around Kovada, said Saraswati Kavula, of the non-profit in Hyderabad, Forum for Sustainable Agriculture. She said the poor should not be displaced to supply power to metro cities. GE Hitachi and Westinghouse are the two American companies that are in the fray to provide nuclear reactors to India.